Every few weeks, in what I assume is a uniquely Protestant ritual, a dozen small children stand at the front of our church and sing for the congregation. A kindly woman conducts, her muted soprano nearly the one voice audible. The adults look on from the pews, ears straining. Too old to have kids of my own in the children’s choir, and too young for grandfatherly doting, I wait out the performance, slightly bored. My eyes wander over to the accompanist sitting at a small electronic piano. I’ve observed three different women fill this role, ranging in age from a college student to the associate pastor’s mother-in-law. One gives piano lessons, and occasionally plays the organ for services. The other two, to my knowledge, have no particular training. You don’t need exceptional musical talent to play “Jesus Loves Me” and “This Little Light of Mine.” The three women share important qualities, but their gifts don’t primarily involve music. The accompanist’s face shows intense concentration. 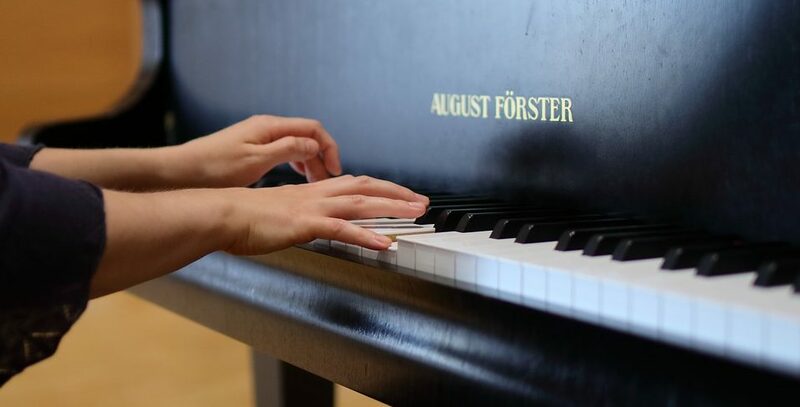 She sounds each note distinctly and correctly, because the children, picking their noses and waving to their moms and dads, need steady guidance to get through the tune. Like any accompanist she maintains a tactful hush, playing just loud enough to support the tiny voices. More than other accompanists, however, she’s alert for dropped phrases or a flagging tempo, any sign that she needs to adjust her playing. She doesn’t smile indulgently, or glance toward the pews. She’s focused entirely on the little ones she serves, who unconsciously demand her grace and humility. She isn’t in it for laughs or applause, or a musical challenge. She’s needed, so she plays. We keep hearing pleas for “civility” amid stories of shouting matches and a once-inconceivable rudeness. That’s, of course, if we talk to each other at all. We hear, too, about the joys of “giving back” and “servant leadership.” What exactly do these public virtues mean? Is civility just a matter of being nice–of refraining from inflammatory words and abusive speech? Do giving back and servant leadership mean helping spruce up a neighborhood park, or signing up at work for a get-your-hands-dirty event? It would be great if there were some secret to these selfless acts, some way for everyone in a pluralistic society to agree to do good deeds. I have no philosophical approach to offer. I just keep thinking about the face and hands of the children’s choir accompanist. She makes sure she gets every note right. She pays attention to detail. When we talk with people about conflicts in our neighborhoods, or about the issues that have torn our country in two, the same methodical patience seems a good place to start. Check a fact. Use the right pronoun. Be sure what a word means before saying or typing it. Like the accompanist piloting children through a melody, we head off a bunch of messy problems when we care enough to be correct. The accompanist listens. We’ve heard that one before, but she listens in a way that’s worth noticing. It isn’t as if the children have some musical gift she’s dying to hear. Most of them are barely making sounds. Nor is she absorbing the message of the words–that’s for the congregation to do. Ready and expectant, she listens for a delicate collaboration, and for circumstances to tell her what to do next. Something is happening while she plays and the children sing. She pays attention and does her part. Along with listening to what other people have to say–to their “point” or “perspective”–we too can listen for the emergence of a mutual effort, for the new idea or course of action we’re helping bring forth. Breakthroughs and solutions must come from somewhere–why not from us, right here and now? If the children in the choir ever stop looking at their toes, or at the stained-glass windows, or at the organist in the balcony cleaning his glasses, they look at the conductor’s motioning hands and encouraging smile. They never look at the woman who plays the right intervals, precisely keeping time. In thankless obscurity–sometimes literally in the shadows–the accompanist serves people who will never acknowledge her, who can give her nothing in return. When the last song ends, she slips back into her pew. In a few weeks she’ll show up and do it all again. David Heddendorf lives in Ames, Iowa. His essays have appeared in various magazines, including most recently the Cresset.